Wilson Special Collections Library holds a number of books, articles, and similar resources detailing the history and present controversy surrounding the "Silent Sam" Confederate Memorial on the UNC campus. In addition to the resources focused primarily on "Silent Sam," books and articles on the history of Confederate memorials and monuments more broadly and the history of UNC will also be useful to researchers. 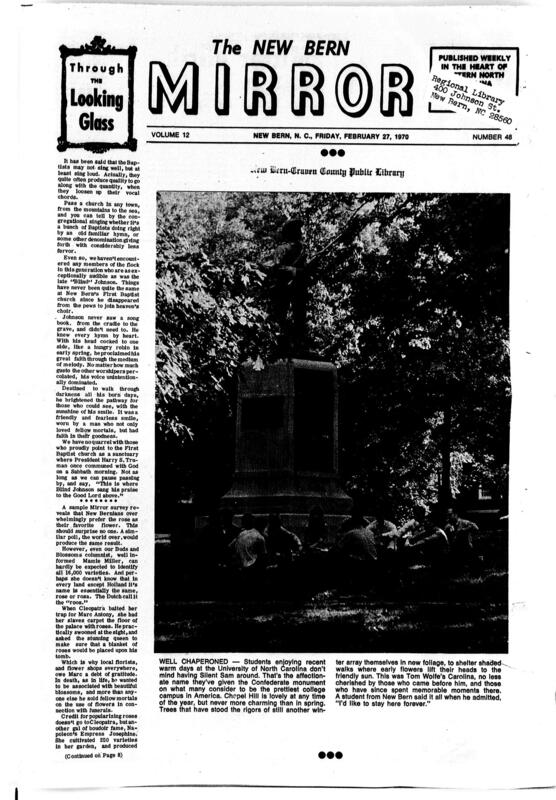 This article, from one of the earliest editions of the University of North Carolina Alumni Review, describes the ceremonies surrounding the dedication of the "Silent Sam" memorial. The article lists the individuals who gave speeches at the event as well as prominent attendees. An excerpt of the dedication speech given by North Carolina Governor Locke Craig is included alongside a photograph of the memorial unveiling. The article and other early issues of the Alumni Review are also available online. Although not directly concerned with the "Silent Sam" memorial, Bishir's article provides useful information about the push to memorialize the Civil War in North Carolina. In particular, Bishir describes the role of women's organizations, such as the United Daughters of the Confederacy (major supporters of "Silent Sam"), in building memorials and monuments across the state. Bishir, Catherine W. "Building a Southern Past, 1885-1915." Southern Cultures Inaugural Issue (1993) Available online. Butler's work describes the history of Civil War commemoration in North Carolina in the century following the conflict's end. Butler discusses a number of key topics including the reasons why North Carolinians wanted to construct monuments after the war, the groups and individuals crucial to memorial efforts across the state, and the changing nature of commemoration over time. The book includes images and a list describing all of North Carolina's Confederate monuments. Cox provides a history of the United Daughters of the Confederacy and examines the role of the organization in preserving and promoting the history and culture of the Confederacy as well as the group's leading role in erecting memorials, like "Silent Sam," across the South. In addition, Cox discusses the goals of the organization and the actions taken by the organization in the pursuit of those goals. This volume is the text of the speech given by Bettie Jackson London to the University Trustees at the presentation of the Confederate Memorial at UNC. London was a member of the North Carolina chapter of the United Daughters of the Confederacy. The speech is also available online via HathiTrust. This two-volume history of the United Daughters of the Confederacy was published and written by members of the organization in 1956. Although the work presents a highly favorable view of the organization, it can still be useful for researchers interested in the UDC's founding principles and goals as an organization. Vincent's article focuses on the history of North Carolina's many Confederate monuments. In particular, Vincent examines monuments constructed between 1865 and 1914, a time period that includes the building of "Silent Sam." Archival materials from the Southern Historical Collection, University Archives, and North Carolina Collection Photographic Archives are excellent resources for researchers examining the building of UNC's Confederate memorial in the early 20th century and more recent debates about the memorial and its place on the University's campus. John Kenyon Chapman Papers, 1969-2009. Southern Historical Collection. Collection # 05441. Chapman was a social justice activist, organizer, and historian focused on workers' rights and African American empowerment in central North Carolina. Chapman was intimately involved in the discussion about race at UNC and helped organize campus groups on this topic. Records in this collection document the debate surrounding the "Silent Sam" memorial and Saunders Hall as well as other similar issues. Julian Shakespeare Carr Papers, 1892-1923. Southern Historical Collection. Collection # 00141. Carr was a prominent businessman in Chapel Hill and Durham during the 19th and early 20th centuries. Carr was also active in several Confederate veterans' organizations and gave a series of speeches on race in North Carolina and the South. One of these speeches was given on June 2, 1913 at the dedication of the "Silent Sam" memorial. This collection includes an original copy of this speech (Subseries 2.2, Folder 26) as well as records documenting Carr's civic and business activities. F.P. Venable Papers, 1838-1946. Southern Historical Collection. Collection # 04368. Francis Preston Venable was professor of chemistry at the University of North Carolina at Chapel Hill, 1880-1930, and president of the University, 1900-1914. Of particular interest regarding the subject of UNC's Confederate monument, Venable wrote a speech at the time of its dedication entitled, "Acceptance of the Monument." University of North Carolina at Chapel Hill Image Collection, 1799-1999. North Carolina Collection Photographic Archives. Collection # P0004. This collection contains over 8,000 images of UNC including many showing the "Silent Sam" memorial and other campus landmarks. Photographs taken at the memorial's dedication as well as photographs taken of the memorial during the 1920s can be found here. Many of these images have been digitized and are available online. Hugh Morton Photographs and Films, late 1920s-2006. North Carolina Collection Photographic Archives. Collection # P0081. Hugh Morton documented the people, places, and things of North Carolina during the 20th century. Included in this vast collection are many images of UNC campus and student life. Particularly relevant are the photographs showing "Silent Sam" in the 1940s and the memorial with graffiti following the 1968 assassination of Martin Luther King, Jr. 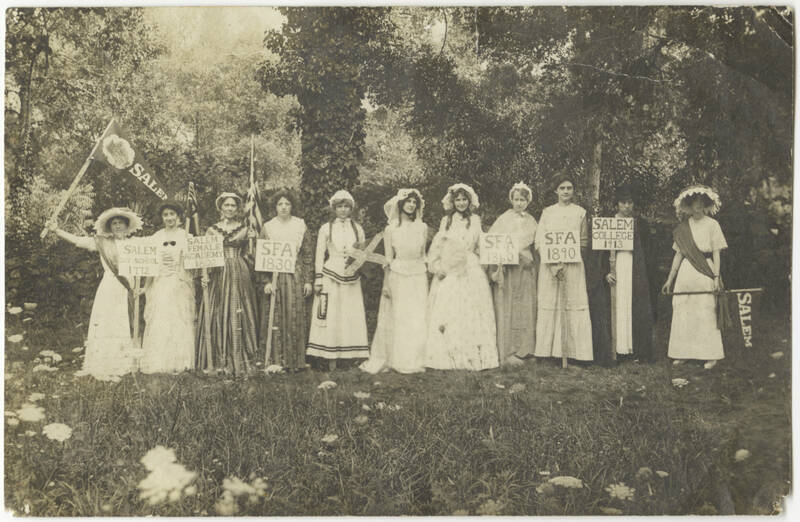 Many of the photographs have been digitized and are available online. The University Archives in Wilson Library has developed an extensive Guide to Resources about UNC's Confederate Monument. This guide includes a timeline, links to scanned archival resources from Wilson's collections, a photo gallery, and further reading. The Daily Tar Heel is the main student publication at UNC. Published daily during the academic year, the newspaper is a good resource for information on the reaction to the "The Student Body" statue. In addition to news articles, editorials and letters to the editor may be useful. This title is available on microfilm in the North Carolina Collection. DTH issues from 1893 to 1992 are available online through two sources: Newspapers.com, a subscription service available to users affiliated with UNC-Chapel Hill and to patrons in the library buildings, and the Digital Heritage Center, which is freely available and accessible off-campus. Visit the Daily Tar Heel website for articles dating from about 2005 to present. Additionally, UNC library staff have compiled a headline archive that can be used as reference to find original articles. The long-running publication of the Black Student Movement at UNC is another good resource for understanding the response of students to the installation of "The Student Body" statue. Copies of the paper from 1969 to 2013 can be found in the North Carolina Collection. The paper can also be accessed online. Issues from 1969 to 2001 are available through DigitalNC and issues published from 2009 to 2013 can be found at the group's website. In addition to student publications, the North Carolina Collection holds a large number of newspapers from around the state. Many of these, such as the Raleigh News & Observer and the Durham Herald-Sun, report on campus news and controversies.